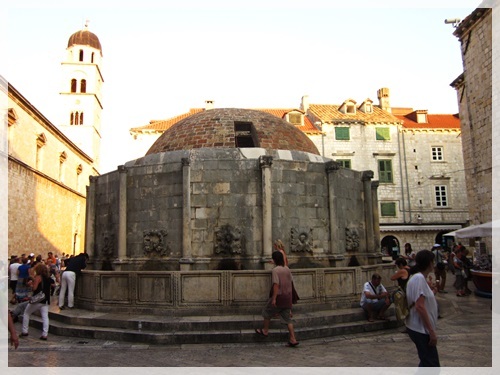 Although Dubrovnik is wonderful for exploring at your own, you may prefer to join one of the guided tours of Dubrovnik. There is a number of guided tours of Dubrovnik available. Exploring the Old Town sights on guided tours usually starts from Pile Gate from where you continue to beautiful Stradun street. First sight is Great Onofrio's Fountain built in 1438. On the left is Franciscan Monastery, with one of the oldest pharmacies in Europe. At the very end of Stradun you will find Orlando's Column, Sponza Palace, Church of St Blaise and Bell Tower. Walking further you will come across Rector's Palace - the seat of Republic's government and of the Rector. Nearby you will find Dubrovnik's Cathedral which houses gold and silver reliquaries and paintings by Italian, Flemish and Croatian artists. Some tours visit Old Harbour where you hear the legends of the famous Quarantine and the nearby fortresses of St Luke and St John. You can choose from Dubrovnik tours of different duration - from one hour to several hours depending on available time. You can also choose from a private tour or a group tour. Taking a city walls guided tour is a great way to enjoy breathtaking views of the Adriatic sea and Dubrovnik's Old Town. These tours will teach you how the fortifications protected the prosperous city of Dubrovnik from its powerful enemies for centuries. Visit the highest point of the city walls - Minceta Tower or Bokar Fortress near the Pile bay. Lately, Game of Thrones tours, which take you to the filming locations of this popular TV series, are very popular among visitors. Climb to the Lovrijenac Fortress which stands on 37m high cliff. On the other hand, if you're after something a little different and perhaps more relaxing, you can take a food and wine tour in which you will stroll down the ancient streets of the Old Town, stopping to visit some of its great sights and to taste the local specialities over a glass of local wine. In this tour you will visit several great restaurants in Dubrovnik. If you are a fun of little adventure, why not try to paddle along the city walls on a guided kayaking tour of Dubrovnik. This way you will enjoy amazing views of the city walls from the seaside. For those who would like to enjoy bird's eye views of Dubrovnik should definitely take a cable car tour to the top of Mount Srdj above Dubrovnik and take amazing photos of the area. There you will visit Museum of the Croatian War of Independence, which through its various exhibits, shows how Dubrovnik defended itself during the 1991-95 war. You can also take a hiking tour which will take you along the walking path to the top of Mount Srdj.